The Kenting National Park is the go-to vacation spot for people all over Taiwan looking for a peachy beachy escape for the weekend. There are a few well-known beaches frequented by tourists, but did you know there are some amazing local spots that tour guides don’t tell you about? If you aren’t a fan of crowds and typical tourist attractions, here’s a compilation of the best secret spots in Kenting for your next visit to the tropic paradise. Although the American military, which spent some time here during the 20th century, has long packed up and gone, it left behind numerous abandoned structures. If you’re into exploring eerie deserted buildings or ruins, Kenting is decked with old military bases, dormitories and forts due to its geographical significance during war times. Next time you visit, take a detour and see if you can spot a few of these historic structures to traverse. Trespass/explore at your own risk/pleasure. Sitting right alongside the military base is something that looks like it’s straight out of movies—the Lianquin Plains is a massive field of green atop of the highest point of Kenting’s eastern peninsula. Its high altitude allows a view of both sides of the ocean, which surrounds the never-ending meadows occupied by nonchalant cows. It’s the perfect spot for a picnic, yoga or just an aimless frolic. This park can no longer really be considered a “secret spot” due to its recent discovery by the throngs of tourists showing up in buses. However, it’s still worth a mention because of a few of its trails that lead to almost completely remote beaches. While Longpan is just a quick selfie stop for most, it’s actually a stunning area that warrants at least a day of hiking and beach discovery. But remember to save some energy and water for the trek back up, as it can be gruesome in the southern sun. Most people drive right past Wanlitong as they head to South Bay (南灣) or White Sand Beach (白沙灣) without paying much attention to this beautiful snorkeling spot. This small bay is very convenient to get to and is only used by one local snorkeling shop so you won’t have to bump heads with anyone. With mostly local residents and employee housing for a nearby beach resort, Wanlitong is much quieter compared to the tourist hotspots. Furthermore, the neighboring Grandma’s Noodle Shop (萬里桐阿嬤麵店) is a fantastic place to refuel with some local cuisine after a long day of outdoor activity. If there’s one thing you should know about extravagant temples, it’s that it’s usually the gathering hub for the locals. If you want a more authentic taste of Kenting, stick to the area surrounding Fuan Temple. It sits in Checheng Township (車城鎮), just a few minutes drive away from the beaches. There’s a famously delicious sweet mung bean soup (綠豆蒜) right next to the temple, along with more tasty local eateries that are both authentic in taste and price of southern customs. The temple also offers housing for worshippers or travelers, providing rooms for 10 people for only NT$3,000. Scratch what anyone else has ever told you—this is the place to get sashimi in Taiwan. In a warehouse-like structure next to the harbor are rows and rows of shops selling fresh seafood they caught on their fishing boats parked only meters away. You can get plates of 20 sashimi pieces for only NT$100 as well as deep-fried dishes of (non-endangered) fish species you can’t find anywhere else. On the other side of the harbor sits the outlet for water used for cooling at the nearby nuclear power plant. Fishing is not allowed in the area, so the marine life is abundant. The bay is also almost always calm due to its deep curve, unaffected by strong currents. The shallow waters allow an easy and relaxing snorkel experience, but remember to prepare snorkeling shoes and attire, as the coral reef can be quite sharp. 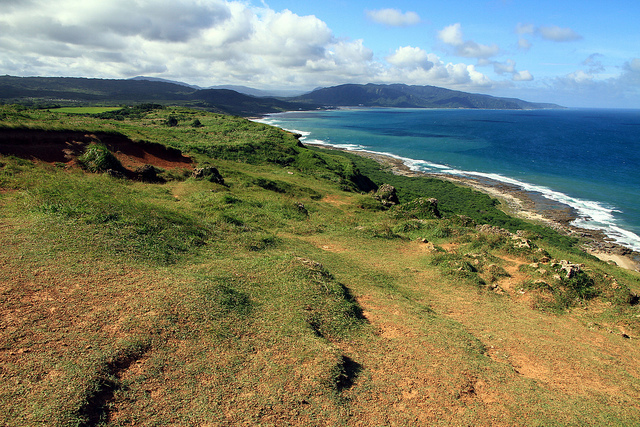 The entire Kenting National Park is technically a protected area, but nowhere is as protected as the Seashell Bay. Sitting adjacent to the obviously very exciting Seashell Sand Exhibition Museum, dedicated to sand and the shape of sand, the beach is technically closed off to all visitors with a very well-enforced (ahem) single piece of rope. While most tourists drive right on by, the corals that sit right next to the borders are actually a great snorkeling spot during calm currents.